The egg-shaped camera arrived with virtually no instructions, but included a note to upload software. Once uploaded the camera almost works by itself. Heck, I even figured it out! Open the software on the computer and plug the camera into a USB port. The camera LCD lights immediately come on and the image from the camera pops up onto the screen. The digital microscope comes with a focus ring and two plastic attachments that help stabilize the camera above the object to be photographed. Depress the shutter release atop the camera and bingo, a jpg picture file is stored on the computer. Pyromorphite from the Manhan Mine in Loudville, MA. The field of view is about 2mm and the crystals average 200 microns in length. The lead phosphate spindles represent a secondary mineral after galena and sit inside the cubic-shaped boxwork left by the dissolution of galena. 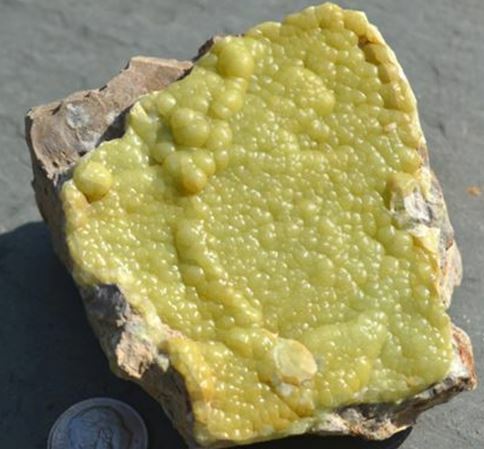 I decided that my first subject mineral would be the millimeter sized bright green pyromorphite from the Manhan Mine in Loudville, MA, a site detailed in the November 2017 newsletter and one the club plans to visit on its upcoming June trip. If you are lucky there can be bright orange wulfenites with the pyromorphite. I was not lucky! OK, that is really neat and a great improvement over any standard lens or phone camera, but the zOrb digital camera does have serious limitations. The depth of field is very limited. 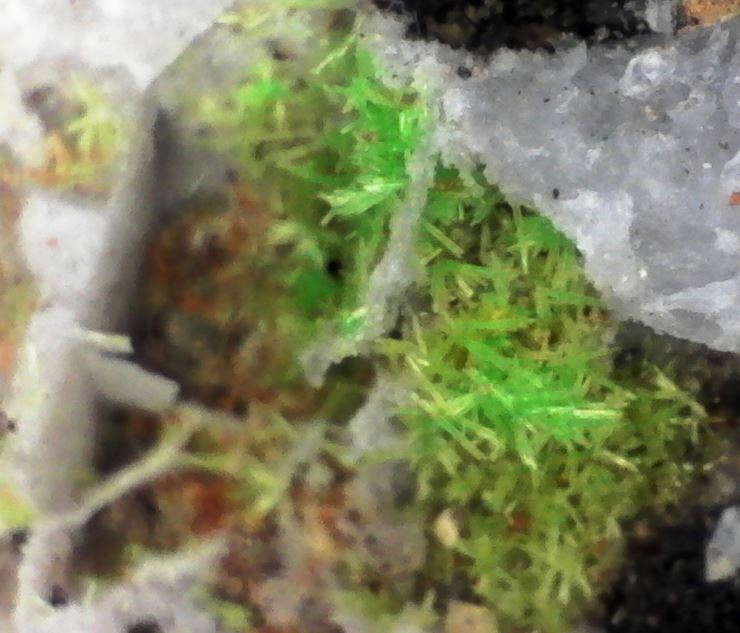 You can surely see that only a small portion of the pyromorphite spindles are in reasonably sharp focus. This is accentuated by the lack of a tripod to steady the camera. I was, however, fairly impressed by the lighting provided by the LED lights mounted inside the device and the color matches the specimen well. I cropped the pictures a bit, but did nothing else to them once on the computer. At the Buffalo show in late March, I purchased a rather ugly galena piece from Morocco because it had a couple small clusters of barely visible proustite crystals perched atop it. 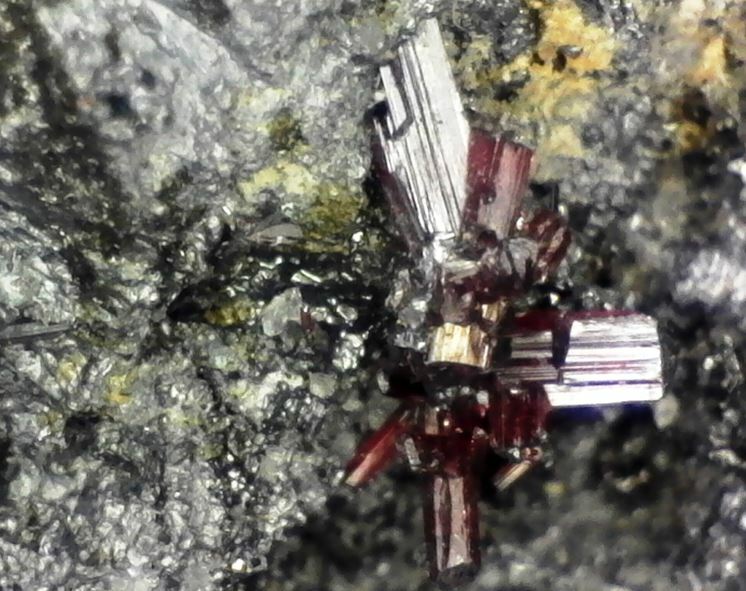 Proustite is a sulfosalt (Ag3AsS3), often called ruby silver for its brilliant color. Well, they were small to the naked eye or even to a 20x loop, but my powerful 65x zOrb digital microscope found them easily and captured their brilliant hue with ease. Proustite on galena from Morocco. Field of view is about 2 mm across. For those of you metrically challenged, 2mm is just under one eighth of an inch. Given its weaknesses, the camera/microscope is best suited for flat surfaces, and it will work well with my second hobby, stamp collecting. But there are geologic subjects that are quite flat. 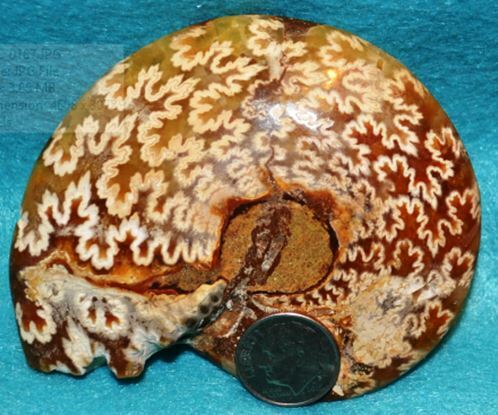 Have you ever wondered what the sutures on an ammonite might look like? Well, I happened to have one lying around so I wiped off the dust and stuck him under the powerful vision of “zOrba”. I’ve even given it a new name now! 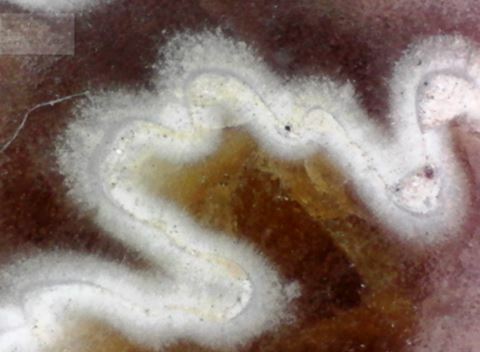 Someone brighter than me can perhaps inform us of the Genus of this fellow from the suture pattern. All I can do is show the detail of the pattern with my new toy. Now lets imagine how that critter grew those elegant sutures (and why). A single suture from the ammonite depicted above as viewed under zOrba’s magnification.. 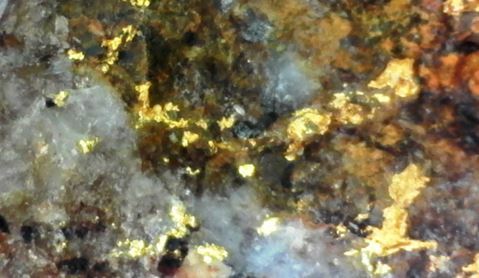 Naturally I had to test out the thing on my best piece of personally found gold ore. Back in the ancient past, the decade of the 1980’s, I was scrambling around the desert southwest in search of gold. I even found a little in the Brooklyn Mine of the Dale Mining District of southern California. Now I can make the micron-size flecks look huge with by powerful zOrba. Yes, I know, I am still not rich. Yes, that is gold. The largest flecks approach 50 microns in size. For those of you joining us in PA the first weekend of May, our first stop will be Mt. Pleasant Mills and we will drive atop the quarry in search of wavellite. We’ll try to find it as fully formed green botryoidal balls lining fractures in the host sandstone. The kind of specimen that sits well in the cabinet without the help of magnification. Perhaps we will even find some like this piece. Wavellite: a hydrated aluminum phosphate, from Mt. Pleasant Mills, PA, collected by the author in 2014. But more than likely we will find flattened broken sprays of colorful wavellite lining thin factures. But that too is pretty nice and even more impressive when magnified and preserved digitally by the power of zOrba. 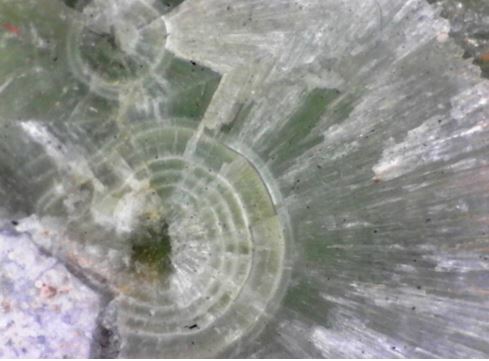 Radial wavellite spray displaying multiple growth periods Field of view is 3mm across. If you can accept that this is more of a toy and a tool for viewing small objects and not a camera capable of producing high quality images then it may be worth the $50 that it costs. In addition to the single shot mode with which all these pictures were taken, the camera has a timer option and also a video mode: imagine watching a tiny insect crawl across a leaf. I have yet to try these operating modes. I do not regret my purchase and I imagine you will see more of zOrba’s work in future newsletters. She’s beside me right now! I also have a digital microscope similar to yours. Mine is Celestron. The deapth of field is shallow on these, as with any microscope. There is, however, software that will combine multiple shots at different focus levels and give you the appearance of a much wider DOF. Oooops, I see I must have mentioned my website to you already. I might like to be educated in the depth of focus stacking process. 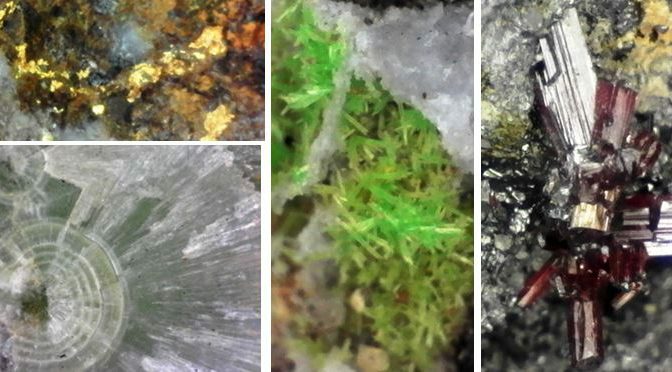 I’ve known about it from seeing comments by mineral photographers, but their process is way beyond my interests and potential budget. If there is a simple and relatively inexpensive process that might be something I could get interested in.